Charlton battled their way to a victory at The Valley today against a reasonable West Ham team, and ensured that 2005 at least finished on a happy note. Front pair, Shaun Bartlett (see pic) and Darren Bent scored in a two-nil win, to leave the Valley faithfull far happier than the East End Hammers fans. Alan Curbishley had to make two changes from the team that lost gallantly to Arsenal on Boxing Day - Chris Powell coming in to the defence in place of Sorondo, and Dennis Rommedahl replacing the suspended Murphy. Both inclusions resulted in changes to positions - Hermann Hreidersson moved back to centre back to accomodate Powell, and Radistan Kishishev moved inside for the flying Danish winger. West Ham had a number of injuries, but Shaun Newton and Paul Konchesky both returned to former home turf, and received warm handclaps from the home fans before the game. West Ham lined up 4-4-2, and looked much as Charlton did a few seasons back. Ex-Addick Alan Pardew has obviously learnt from Curbishley, and has a committed team that works hard, and tries to make up for a lack of flair with passion and fitness. It was a real throwback to see Shaun Newton playing wide right, and then later moving to right full back as West Ham chased the game, much as he had done many times previously at The Valley in the red shirt of Charlton. West Ham started the brighter (as most teams do when playing Charlton these days) and almost scored within the first minute. It took Charlton over ten minutes to have an attack and then the game settled into an end-to-end battle with chances falling to both sides. It was West Ham who created the better ones though, and looked the more likely to score. 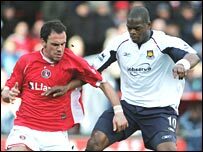 Reo-Coker was controlling midfield, and Marlon Harewood (see pic, with Kish) up front eager and dangerous - Charlton's first goal then came as something of a surprise. Darren Bent was first to a clearance out wide right, and turned his man. He made ground then hit an early cross to the far post, past the retreating West Ham central defence, and found Shaun Bartlett who clipped the ball high into the net off the underside of the bar. Charlton then had another two chances immediately afterwards, but first Rommedahl's shot was turned past the post by Roy Carroll, then Bartlett missed his volley-kick when well placed. On both occasions, referee Graham Poll got the resultant decision wrong, giving a goal kick after Carroll's save, and a corner from Bartlett's volley. Bartlett and Holland then had further efforts blocked when well placed to score later in the half. West Ham had the last good chance of the half, when Shaun Newton brought a good block from Thomas Myrhe. Charlton started the second half much better, although the game was still fairly even. Rommedahl's deflected shot hit the post and bounced safely away, and Myrhe was off his line swiflty to collect through balls aimed at Harewood. Darren Bent scored Charlton's second goal midway through the half, rising majestically above a static Paul Konchesky to head a Chris Powell cross into the corner of the net. Hammer heads dropped visibly after this goal, and it was then merely a case of seeing if Charlton could hang on to a two goal lead. Changes to tactics tightened up the midfield with Rommedahl brought tighter inside, and Lisbie replacing Bartlett, and Charlton's defence looked fairly solid. Hreidersson had a header from a corner well saved; Lisbie turned and shot just wide from close range, and Bent had a shot blocked by Ferdinand's head. The last real scare for Charlton was when their defence failed to react to a clearing header knowing that two Hammers forwards were in offside positions, and that allowed Isreaeli sub Benayoun a free run on goal. His shot did not trouble Myrhe though, and went harmlessly wide. This was not a great game, but at least the passion and effort seems to have returned to the Charlton team. This is best summed up by Matt Holland (see pic) - not the most skillfull, nor the most competitive, but he ran, harried, contested and blocked all during the game today, and was my man of the match for his sheer effort. Rommedahl, Powell, Hreidersson, Young, and Myrhe also had good games. 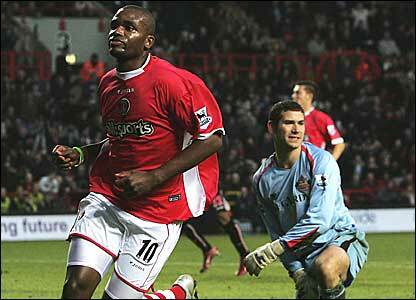 Charlton finished the 2005 year with just five home league wins - a poor return. Let's hope 2006 provides more home cheer than this. The next fixure, barring a repeat of the midweek postponement is at Goodison Park against Everton on Monday. No new injuries seemed to be picked up today, which is good news, and a similar team will no doubt play against the Toffees, though Danny Murphy is available once more after his ban. Hopefully, we can continue the resurgence, and start 2006 as we finished 2005, with a win and three more points. WHam Bang, thank you Maam! 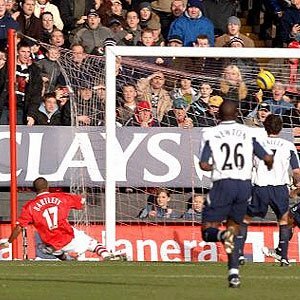 Charlton's final game of 2005 is another home local derby, this time against West Ham. The Hammers come to The Valley on the back of indifferent form from a reasonable season so far. Hammers manager Alan Pardew is an ex-Addick, and was a mainstay of the early Curbishley-Gritt teams of the early Nineties. He scored quite a few goals for Charlton from midfield, much as he had done for Palace previously. He took a large amount of stick from West Ham fans last season, after failing to get them promoted in his first year in charge, but now in the Premiership, after winning the play off final at Cardiff last May, he is getting the support he previously lacked. Other ex-Addicks who are likely to be involved tomorrow are Shaun Newton, and Paul Konchesky. Newton didn't quite have enough for the Premiership according to Curbishley, but has made a good stab at top class football since, first with Wolves, with whom he gained promotion, and now West Ham. He has been involved in three promotions to the Premiership, so he must have something to offer. 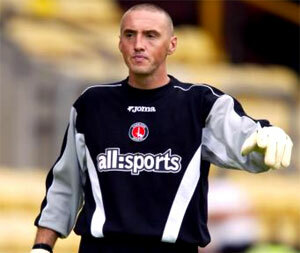 I was always a Newts fan when he played for Charlton; he gave 100% every week, unlike some of todays players. He scored some great goals too. Everyone remembers the play-off semi-final winner at home to Ipswich, but he scored a couple of great goals at the other end too - the first was possibly his first ever in the league, a chip from the right wing (from in front of the barren open terrace) about 40 yards out, after a bad goalkeeping mistake presented him with the chance of an open goal. The second fabulous goal I remember him scoring was against Huddersfield - Charlton had been losing for much of the game but Newts scored a late equalisr, and then an amazing headed winner in the last minute from the corner of the penalty box. The header, after a clearance went straight to him, just kept going and going, over the players, over the keeper, over the guys on the line, and in! Pandemonium! Konchesky's performances for Charlton are much fresher in the mind. Konch (left) was the youngest Charlton player ever when he made his debut in 1996, aged just 16. He was a good left back, but never quite good enough, so Curbs bought Chrissy Powell which left Konch as a reserve or playing further forward. He also seemed to give his all most matches, and often played out of position just to get into the team - right back, one of three centre backs, left midfield, centre midfield, anywhere that would get him into the team. Of course, he saw himself as an out-and-out left back, and when Ashley Cole and Wayne Bridge were unavailable for England, he made his international debut in the infamous Australia game at Upton Park, his only cap to date. Both players will be welcomed back by the Valley faithful I think, at least until the game starts! Also playing against his old team will be Chris Powell, who spent much of last season in the Championship with West Ham, before returning to his spiritual home prior to the start of this season. Charlton will be without the suspended Danny Murphy, and it's also likely that Smertin and Thomas will not feature. Sorondo will have a fitness test. I expect Darren Ambrose to play instead of Murphy, and Perry or Spector if Sorondo does not make it. Dennis Rommedahl should make the subs bench for this game, and don't be surprised to see Jason Euell there too, in place of Kevin Lisbie. A rested Charlton will be hoping for three points to end a miserable year on the right note, but it will be a tough game. Pedro45's score prediction is a 1-1 draw, and the one-to-watch is Darren Bent (left), who could get among the goals much as Wigan's front two did against the Hammers a couple of days ago. Parker to face Charlton for the first time? Charlton take the long trip up to St James Park tomorrow to face Newcastle, and Scott Parker for the first time since he was sold to Chelsea a couple of years ago. Parker was suspended for Newcastle's capitulation at Anfield yesterday, and looks certain to replace Lee Bowyer, who was sent off against Liverpool and is therefore suspended tomorrow. Newcastle will also be without Steven Taylor, who dislocated his shoulder in the same game. Charlton will also need to make changes - Danny Murphy also got himself sent off on Boxing Day, and Gonzalo Sorondo is injured and will definitely miss the game too. With this being the second game in two days, it is likley that other changes will need to be made, and other players will undoubtedly get their chance in the side. I expect to see either Chris Perry or Jonathan Spector (who looked much more comfortable there against Arsenal than he has at left back) return to the centre of Charlton's defence in place of Sorondo, and either Alexei Smertin (if fit) or Darren Ambrose (left) replace Murphy. If Smertin can play, I would like Ambrose to come into the team and face his former team-mates in place of Bryan Hughes, who looked out of position and depth on the left wing yesterday. Dennis Rommedahl, Jason Euell, Talal El Karkouri (if he's recoved from the strop he threw before yesterdays game after being told he didn't feature), and Chris Powell, could all also be involved, especially if Curbishley reverts to a 4-5-1 formation. With Newcastle in disarray once more and Sounness's head seemingly on the block, it would be a good time for Charlton to get a result on a ground where they have previously and recently done well, and see another manager dismissed after a defeat against Charlton. On the minus side, Alan Shearer needs just one goal to reach 200 for Newcastle, and equal Jackie Milburn's club record. He has a recent habit of scoring against the Addicks. Any result for Charlton would be a big bonus, and it is a game that they should look forward to after the revitalised display against the Gunners. Come on you reds! Yes, there was more boo-ing at the end of this game, as with most other home games recently, but instead of it being aimed at the losing Charlton team, this time it was most definitely aimed at incompetent referee and Crystal Palace fan Steve Bennett. Bennett was fairly awful throughout, being chided by both sets of supporters during the match, as he made error after error. Bennett is (apparently) an experienced Premiership referee, yet it seemed that he instructed both linesmen to concentrate on offsides solely (which they didn't do very well, but that's another matter...) rather than help him with decisions when they were much better placed. It was a real shame that the injury that threatened to see Bennett replaced by the fourth official durng the first half did not get worse, as the game would have benefitted enormously. Rash tacklles flew in, from both sides. 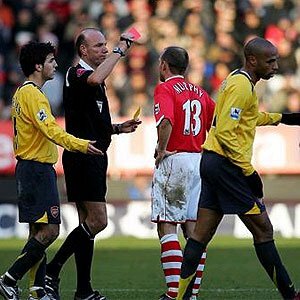 Sorondo, starting his first Premiership match for Charlton was booked after a second tackle from behind (his first having missed player and ball...), and he then received a slightly late, but very painful late challenge from Fabregas that put him out of the game completely. This tackle did not even warrant a foul, though the linesman saw it at close hand, and even acknowledged to the crowd and substitutes that he thought it was a foul. Why he didn't flag was astonishing. To the football - Alan Curbishley did what he said he would, and changed things around. Out from the team that lost so poorly to Wigan last week went Chris Perry, Chris Powell, Alexei Smertin (due to a knee niggle), Jerome Thomas (unwell), Darren Ambrose and, most conspicously, Dean Kiely. 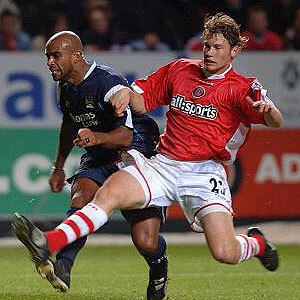 In came Jonathan Fortune, Gonzalo Sorondo, Thomas Myrhe, Matt Holland, Bryan Hughes, and Shaun Bartlett, as Charlton lined up 4-4-2, with Hermann at left back, and with Kishishev on the right and Hughes the left of midfield. The official match report is here. Arsenal made the better start, and looked fairly comfortable for a team that had lost their last three Premiership games. Wenger became increasingly frustrated though as the deadlock became hard to break. The best chances fell to Ljundberg, who was played through on a one-to-one with Myrhe in a beautiful fast counter-attacking move, and then had another chance from the inside right position. In both cases, Myrhe proved a very capable Premiership goalkeeper, by saving the efforts. Charlton slowly came into the game as the team settled into their new formation, and Murphy, Holland and Bent all had shooting chances. Darren Bent's was by far the best chance, having been played through by Murphy, but a great recovering tackle by Sol Campbell cleared the ball for a corner just as Dazza was about to shoot. The second half started with Arsenal obviously stepping up a gear; Henry, who had clipped the top of the Charlton crossbar just before half time from a free kick, became much more involved and busy. The pressure built, Myrhe made some good saves, but the inevitable goal eventually arrived. Henry had a shot from the six yard box blocked by Sorondo, then his follow up shot well saved by Myrhe. The ball broke to Reyes though, and he buried the chance calmly (see pic). Charlton tried to rally, but the Hreidersson foul and Murphy sending off soon after the goal, then the Sorondo injury-linked substitution, killed them off. Charlton did not look like scoring after that and seemed to settle for a one-nil loss, but a moral victory. Of the new boys, Myrhe was excellent, and looks sure to keep his place for the Christmas and new year period at least; Sorondo played well until limping off, and Fortune also had a good game; Hughes looked out of position on the wide left and did not contribute much at all; Bartlett ran well, and won a few headers too, but did not look at all dangerous (replacement Lisbie was much more innocuous though, and did very little in the twenty five minutes he was on the pitch); Matt Holland ran well all game, and harried and challenged all over the pitch - it's just a shame he doesn't tackle much. The best on field performance though came from a revitalised Hermann Hreidersson at left back. He charged around, rampaging up and down the pitch, and tried his heart out. He dumped Freddie Ljundberg on his back-side toward the end of the game with a flick of his hip that the Swede did not like at all. Poor Freddie thought better of taking things further though, when faced with the big Icelander! All told, this was a much better Charlton performance, even if the score did not warrant any points. A game that will not go down in memory, but it should lift the management, teams, and supporters spirits after a terrible couple of months. Three more games left before the FA cup match at Sheffield Wednesday, and three more positive performances will mean we go into 2006 in much better shape than we imagined. As tomorrow is most people's last day at work, I thought I'd do the Christmas preview a little early. Alan Curbishley (left) probably won't be feeling in a very giving mood this week, and nor should he! His team have been giving away goals and points way too easily recently. He will definitely want a scrooge-like defence, a without-frills midfield, and a dazzling display up front by the star of the Christmas tree formation - Darren Bent! Not much is likely to change between now and Monday, when Charlton play their first game of four seasonal matches. Tough game, even for anyone who hasn't lost six out of their last seven matches like Charlton. Mind you, Wenger's boys aren't exactly on a roll at present, having lost their last three Premiership matches, and scraped a win on penalties against Doncaster, courtesy of an injury time equaliser. The big news though, is that Thierry Henry is injured, and likely to be out for months. Whether this is true, or just paper talk, or that he's signed a contract at Barcelona or Real Madrid and doesn't want to jeopardise it is all open to debate. Arsenal without Henry are like Charlton without Darren Bent - a different class, and I don't mean higher! Reallistically, any kind of result will be good news for Charlton fans based on the feeble fare served up last week against Wigan, and in previous recent games. Another tough game, following just 54 hours after we play Arsenal and we've got to travel up North too! This is another "point will be good" game - we may get away without having to face Henry, but Owen and Shearer are back playing together and both seem fit at present. Shearer took ages to score his first goal against Charlton (Maybe ten games? ), but since then, he hasn't really stopped. He scored his 200th Premiership goal against us, and now stands on 199 for Newcastle, one short of equaling their all time record (Jackie Milburn). The timing seems good here for him to equal and/or break the record against us next week. Owen has a pretty good record against us too, and don't forget that both Lee Bowyer and Scott Parker (a pair of ex-Addicks) could be playing against Charlton; Bowyer maybe for the last time before he re-joins in January and Parker for the first time since his acrimonious move to Chelsea. He will be boo-ed all the game by the Valley faithful who make the journey, but I doubt they will be heard too often over 50,000 screaming Geordies! The New Years Eve game pits us against our near neighbours from across the river. In years gone past, we could always almost guarantee six points a season when playing the Hammers, but this season it doesn't look so cushy. Of course, if drawn together in the cup, West Ham would always beat us, so things kind of evened themselves out over the seasons. This year, Pardew and Konchesky (left, with Luke Young) are coming up against their former team for the first time. Konch will definitely be up for it, so it would be good to have a right winger who could keep him busy rather than the other way around. Step forward Dennis Rommedahl, the player that Konch will fear most! Luckily, new Isreali signing Yanav Katan, and anyone else they try to get (Andy Johnson bid turned down today...Louis Saha being linked also) will not be allowed to play at The Valley. A good way to end the year, with a win, please Curbs! Another tough away game just after a local derby home match. Everton are so hot and cold at the moment - they can beat almost anyone on their day (Well, Brummies, Boro, Blackburn and Newcastle), but get stuffed big time when they get it wrong (Bolton, Baggies, West Ham). Who knows which team will turn up to play Charlton? Oh, that's right - David Moyes after match speech is already written - "It's the best we've played this season!" A point would again be a reasonable return for Charlton. So it's a pretty tough four matches that we've got coming along, anything like the six points I've hoped for would be a wonderful return. There's no point in guessing the team, as Curbs has said that changes will be made against Arsenal, and injuries, squad rotation, dropping the donkeys, will all come into play in the other games. Andersen, Young, Perry, El Karkouri, Hriedersson, Kishishev, Smertin, Murphy, Rommedahl (left), Ambrose, Bent. I expect that all these players may get a game or three or four over Xmas, and also be joined either in the team or on the bench by Kiely, Myrhe, Powell, Sorondo, Fortune, Johansson, Hughes, Holland, Euell, Thomas, Bothroyd, Bartlett, Lisbie, and maybe even Fuller, Sam, and Varney if we get any injuries. My ones to watch are the Charlton fans this Christmas; we've taken a lot over recent months, and it's time that we got a reward of some sort. Please Curbs, make our Christmas wishes come true and give us something to cheer. It is Euell-time (left) after all! At this festive time, I thought it might be nice to forget how badly Charlton are playing at the moment and pass on my Christmas wish-list to you and to Santa. 1. A decision on who is the number one goalkeeper at the club - Is it the ageing Deano? Or the youngster and "new Peter Schmeicel" Stephan Andersen? 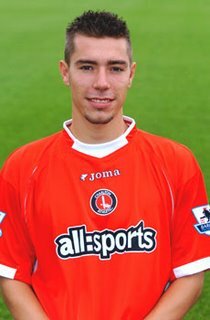 Or the Norwegian Numero Uno and Charlton bench-warmer Thomas Myrhe? Please confirm it Curbs, and then let them play until the end of the season without any pressure. 3. For our number three - big Hermann - to give up being a centre half and return to his best position - left back! 4. More than four wins at home in 2006 please Curbs, cos that's all we managed in the league this year! 5. A centre half as quick as Richard Rufus, or as good in the air as Richard Rufus, or as tough a tackler as Richard Rufus, or any combination of the above. Richard, we desperately miss you. 7. Seventh place in the Premiership - probably the best we can ever hope for, then maybe slip into Europe via the Fair Play draw? 8. Bye-bye to the eight players in the squad who are make-weights now and who are not going to be good enough to play for us next season - Kiely, Fortune, Hughes, Holland, Bartlett, Johansson, Lisbie, Jeffers. Please Curbs, get them off the wage bill in January (why wait?) and get a couple in who are hungry and good - Ashton and Jagielka? 9. Nine months is a long season, and we don't expect to win every week, but at least once a month wouldn't be asking too much would it? 10. Ten outfield players who can score goals, tackle, run, kick a ball, and mark an opposition player; who have heart, passion, desire, and want to play for a successful Charlton team; Ten players who are never injured or argue with the ref or the boss; who can take us into dream land - Europe, and perform there above expectation. Ten players who would be idolised for ever more by the fans if they could do this for Charlton. Just a few wishes...I don't expect them all to come true, but as with everyone at Christmas, getting a little of what you hoped for would be nice. Three nil, and it could have been so much worse. Charlton were awful at times, and gifted three goals to Henri Camara - Young, Kiely, Hreidersson and Perry all committed profesional hari-kari (or should that be Henri-Kari?) by making clear and obvious mistakes. The team lined up as per the previous weeks starting eleven; Bent and Bartlett being declared fit to take their places on the pitch and bench respectively. Eight minutes on the JJB stadium clock and Camara had already had a header flash wide of Deano's goal. Throw in to Wigan on the left wing - all the players are marked tightly. Nobody to throw to, they run, trying to get a yard. The Charlton defence collectively stayed tight, until Luke Young decides to stop and watch the throw. His man, Lee McCulloch, has acres of space in the penalty box to watch the ball come to him and size up the volley. Unluckily for him, it crashed down from the cross bar after beating Keily. Luck was not on Charlton's side though, as it fell for Camara to control, and fire home through Chris Powell's legs on the line. No fault attached to Powell, who was one of the few players who didn't have a poor game. Charlton looked very vunerable after this - any confidence they had dissipated immediately. Darren Bent came close to equalising with a couple of efforts midway through the half, but Charlton were hanging on again nearer half time, the crowd hoping to maintain just the one goal deficit. Matters had not been helped by Jerome Thomas going AWOL a couple of times, for which Powell gave him a tongue lashing, and mentally he completely lost it late in the half. The second half opened with Bartlett on for Thomas, and a switch to 4-4-2. Shouts for a penalty were turned down, though I doubt there would have been many Wigan complaints had Bent been given the verdict when upended by goalkeeeper Pollitt. As so often, a "chance" at one end leads to a goal at the other - Comical defending by Kiely (the main culprit in my opinion) and Hreidersson let Camara steal in for his second. Not long afterwards, Camara made a name for himself by adding his third - Wigan's first Premiership hat-trick - when the whole defence went on strike for about five seconds. This event led to a "fight" in the Charlton end between two visiting supporters, and at least one fan being escorted out; not the sort of thing you want to see, but at least they were passionate about Charlton, which is more than could be said for most of this team. The game drifted on (the fans started to sing to keep warm mainly) to the obvious conclusion, and I left a couple of minutes from the end in order to get back to the station quickly. Wigan are not a great team at all; they played with heart and conviction, with pace but lacked flair. It's sad to say they completely outplayed Charlton, but undeniably they did. The newly laid pitch obviously did not help Charlton, and probably not Wigan either. It was soft, uneven, and the grass looked very short. Individually, Young (left) and Keily had terrible games. Perry and Hreidersson worked hard, but made mistakes too often. Murphy tried to pass the ball but the pitch didn't help him, and he drifted out of the game all too easily. Kishishev worked, but needed too long to control the ball on this pitch (as he does on others too...). Smertin ran and worked hard but to no avail. Thomas gave up, and Ambrose also disappeared from view as the game wore on. Bent ran all day and was unlucky not to score - he deserved better from his team-mates. As for the subs? Bartlett was anonymous, Hughes did nothing but give the ball away, and Spector actually looked committed for the twenty minutes he was on as Curbs switched to three at the back (with Young and Powell as wing-backs). My first trip to the JJB had not been pleasant. It left me in a foul mood for the rest of the night. I expect Curbs, who lectured the players long and hard on the pitch afterwards apparently, was also in no reasonable frame of mind afterwards. Charlton play away at Wigan tomorrow, hoping to build on the back of last weeks win against Sunderland. The official match preview is here. I'll be up at the JJB Stadium for the match, and it will be the 82nd football league team's ground I have seen Charlton play away at. It's rare to get a new team/stadium these days, so I expect a fair number of Charlton fans will have taken up the generous allocation of free tickets. Me? I paid for mine! I also hope that Virgin Trains don't let me down! Curbs will probably stick with much the same team as last week, unless there are any injuries about. It's unlikely that any of the non-starters last week will be able to force their way into the sixteen unless this is the case. There have been rumours about Darren Bent and a sore hamstring, which led to his substitution after an hour or so last weekend, but hopefully a weeks rest will have done the trick. With Jay Bothroyd hitting both a wooden post and the news this week, following on from his sore calf last week which meant he didn't even make the subs bench, we need our best striker on the field. Kiely, Young, Hreidersson, Perry, Powell, Smertin, Kishishev, Murphy, Ambrose, Thomas, Bent. The subs wil probably be Myrhe, El Karkouri, Hughes, Bothroyd (if fit, Bartlett if not), and Rommedahl. My one-to-watch tomorrow is not going to be Alan Curbishley, who I've nominated for the last two games, but Dean Kiely (above). Deano has had some stick since he came back into the team three games ago, but a clean sheet is what our goalie is all about. His confidence will be up after last week, he's back up north not far from Bury where he made his name, and Wigan will test him at every opportunity, so he needs to be back near his best. Pedro45's score prediction is a 1-1 draw; I thought about making it nil-nil but I'm not sure our defence can keep two clean sheets on the trot. I've yet to work out how Charlton have done when I've seen them play away on trips for the first time - obviously famous wins at Old Trafford, Upton Park, Goodison Park and the like come to mind easily, but I've also seen us win on my first visits to less salubrious grounds against teams like Hereford, Oxford, Southport, Lincoln, Plymouth, Bristol City, and Huddersfield. Hopefully, this sort of run will continue! Come on you reds! The all:sports debacle is over, and Charlton will be sporting new sponsors on their chests in future games. The new name we will wear on our replica shirts with pride will be Llanera, a Spanish building company. The Charlton programme warned yesterday that an announcement was imminent, and that all all:sports stock had been withdrawn from sale at the club shop. This is probably so that any Christmas presents bought are not immediately redundant, creating more work for the staff in handing over discounts, as fans would surely demand, and as the club has previously done when changing designs in the past. Charlton will receive a minimum of £6.6m for the 4.5 year deal, and this puts them well above par in the Premiership table of who gets what from shirt sponsors. It may not be in the same league as Manchester United, who currently get £15m a year from Vodafone, or Arsenal, who get over £6m a year from O2, but it is more than Fulham, Everton, and others currently receive. Now we just have to see how long it takes Joma to produce enough shirts for the team, and then the fans...and we won't see them on sale at JD Sports I guess! Additional: A later "Open letter to Charlton supporters" brought back memories of September 1985, but not such controversial news, and announced that no replica shirts would be on sale this season. With anything bearing the all:sports logo having been withdrawn from sale at the club shop, any Llanera logo shirts will have to wait until next season, when new home and away kits will be produced. This will save Charlton from criticism over kit sales, and is a good move to placate supporters at a difficult time for the club. Three points won, but it wasn't very pretty to watch. Goals from Darren Bent (seen just after scoring, left) just before half time, and Darren Ambrose just after half time secured the win, though rock-bottom Sunderland made a good fight of it and would have hoped to have got a result with more luck. Official match report here. Curbs made changes to the starting eleven once more; Radostan Kishishev duly came back into the starting team after his one-match ban, and Jerome Thomas also started the match. It had little effect on the way the team played initially, once more they were slow out of the blocks. The game wasn't really going anywhere, being described on radio and by the guys behind me as dire. Then, just a couple of minutes before half time, Jerome Thomas picked the ball up near the half way line after a failed Charlton attack, came inside but mis-controlled the ball. He dived in to win it before a Sunderland player and the ball broke to Danny Murphy. Rekindling memories of his best form, Murphy turned and threaded a beautiful pass through the centre backs to Darren Bent who cooly stroked the ball into the far corner of the net. Half time came and the crowd and team were both obviously lifted. Soon after the re-start, a strange second goal took Charlton clear. The ball was played in from the right wing, and Darren Ambrose swung the ball goalwards at the near post. From my seat, it appeared that the ball went for a corner, rebounding back onto the pitch from the advertising hoardings. However, in reality, it had hit the post, and then hit a Sunderland defender, who remained transfixed with the ball at his feet. Ambrose reacted quickest, stole the ball from him and prodded it into an empty net. 2-0, and the crowd happy. This could have been bad news for Charlton though, and the upbeat crowd suddenly started to get edgy, remembering previous defeats from two goal cushions. Curbs decided to shut up shop very early, replacing the tireless Smertin - who had a good game - with Hughes, and Thomas - who also tried to be heavily involved throughout - with El Karkouri in a re-shuffled, less adventurous, midfield. Darren Bent was also subbed (for Shaun Bartlett), but this may have been due to a knock he received early in the match. Charlton hardly had an attack in the last twenty minutes or so, preferring to soak up waves of pressure. During this period, Sunderland had two big shouts for a penalty (one foul and one handball) but neither moved the ref. Deano also made one outstanding one handed save, and a couple more sharp stops, during the final part of the game. It wasn't very pretty, in fact it was downright negative tactics from Charlton, but in the end the points were won, and the club and fans will go into Christmas with another home win. Man of the match was hard to figure - Kishishev had an excellent first half, as did Smertin. The defence was better, though not convincing, and Deano kept a clean sheet (the clubs first since September). Out wide, Ambrose disappeared for long periods of the game, and Thomas found it hard to get past his marker. Bent chased everything, but had little to work with. My choice therefore goes to Chris Powell, who had a good game throughout, and looked fitter than he has done for some time. The best news of all though, was that the usual two idiots who sit behind me didn't come, and two new guys took their seats. These guys were not die-hard Charlton or Sunderland supporters I think, but wanted to see a Premiership game; they made reasonable comments throughout - if it was bad, they said so, if they thought McCarthy was rubbish, they critiscized. Sensible lads. I hope they remain for future home matches and the ex-Spurs who preceded them for the last few years don't come back. Well, hopefully! Charlton take on Sunderland tomorrow in the battle of teams with the most consecutive losses - Sunderland thankfully edge this one eight to five! Everyone involved with the whole club is still shell-shocked after conceding eight home goals in a little over 100 minutes of football recently, so a win is being talked of as imperative. Everyone, Curbs, the players, and the fans is desperate for the right result. Let's hope it comes along tomorrow. The team have taken it upon themselves to have a heart to heart, clearing up any confusion about what is required to play for Charlton, and hopefully, we will see a marked improvement since last Sunday. Who plays is still anyone's guess, except the managers I suppose, but it seems fairly certain that Kishishev (left) will return to midfield after a one match ban. This is an area of the park that will be crucial to how Charlton play - Murphy (one of three instigators of the players get-together) should retain his place, and so should Smertin. The three of them (Kish, Smerts and Danny) are the best option we have and played superbly together earlier in the season. But if they all play centrally, it means that the team lines up 4-5-1, something that Curbs may not want to do at home against the Premierships bottom team. Murphy may therefore be asked to play wide, on the opposite side to Ambrose and our flying wingers (Rommedahl and Thomas) may have to settle for the sidelines. It's fairly safe to assume that Matt Holland and Bryan Hughes will not be amongst the starters this week. Up front, Darren Bent will obviously continue, but he may well have a partner alongside him. Johansson and Bothroyd both tried forward positions last weekend, and the single Jay is the better option here. In fact, JJ was so inept that he may be lucky to even get on the bench. In goal, Deano has let in eight goals in two games; Andersen is the better long term option, but was to blame for a few of the previous goals conceded earlier in the season. Thomas Myrhe continues to bench-warm at every opportunity, but I'd like him to get a start tomorrow against one of his former teams. The defence, which has taken most of the blame recently, is where Curbs has tinkered recently, and tomorrow may be another chance to change things around a little in the hope of finding the right solution. The one thing Curbs hasn't changed is big Herman at centre half. With everyuone confirming that left back is a problem position - Spector not good enough and Powell too slow after an hour - I'd like to see our Icelander moved back to his previous stamping ground at full back. This leaves (or maybe just maintains) a gap in the middle, and after a weeks R&R I would bring back El Karkouri. I doubt if Sorondo or Fortune are yet fit enough to challenge, but we could see the Uruguayan on the bench. Myrhe, Young, El Karkouri, Perry, Hreidersson, Smertin, Kishishev, Murphy, Ambrose, Bent, Bothroyd. Subs - Andersen, Hughes, Euell (or Lisbie), Thomas, Sorondo. For Sunderland, Jonathan Stead will be trying to prove he joined the right club last summer (would he work alongside Dazza? ), and the rest of the team will give it a go, as they have little to lose nowadays. My one to watch tomorrow is Alan Curbishley (left). He has had plenty of stick this week - slow substitutions, can't take the team any further, etc etc - so it will be interesting to see his reaction, especially if (god forbid) we fall behind early on. Pedro45's score prediction is a draw - 1-1. That way both sides ditch the losing tag, but nobody goes home happy. For Charlton, a point is better than nothing, though three would be a lovely early Christmas present! The Charlton defence was once again left in tatters, as City's forwards ran riot at The Valley this afternoon. Andy Cole (2), Darius Vassell, and Trevor Sinclair are all experienced players and have played many games in the Premiership. I doubt that they would have collectively enjoyed many afternoons work as much as they did today. All scored, and all combined well - movement, pace, skill - in a way that was way too much for this Charlton defence to cope with. Cole opened the scoring after an opening half an hour where Charlton had rarely seen the ball. Without the suspended Kishishev, the centre of defence looked very un-protected, and lacked enough will or skill to regain possession. Sinclair was giving the recalled Jonathan Spector a torrid time, and setting up chance after chance. Darren Bent then scored an unlikely equaliser (see top picture), before Sinclair decided (just thirty seconds later) to reclaim City's lead with a solo goal where he left Spector trailing in his wake (see left). Darren Ambrose had blaised over Charlton's only other chance of the half when well placed to score. In all honesty, 2-1 was an unfair reflection on the play; Charlton hadn't coped at all well with the City play, and they were lucky to be just one goal behind. Alan Curbishley did make a half time change, but instead of bringing on Chris Powell for Spector, he chose to play Jerome Thomas wide left and give the anonymous Matt Holland an early chance in the shower. Hermann Hreidersson was given the added responsiblity of protecting Spector, but this only served to further weaken the central defence as the half progressed. Twenty minutes in, a Sinclair cross was handled by the Icelander, and Joey Barton took a weak spot kick. Unfortunately for Charlton fans, Dean Kiely, with the only save he made in the whole game, presented the ball back to Barton who scored gleefully to end a traumatic week for him (his brother jailed for murder) on a high note. Sub Jay Bothroyd came on for Jonathan Johansson, and soon scored from a free kick; enough to prove that one Jay is better than a JJ! It was similar chance to that he scored way back in the early months of the season against Hartlepool, but this time he kept it low and near post but with similar power, which was enough to beat David James. 3-2 and the watching TV audience must have been enjoying the goal spree. Hope for Charlton wasn't to last long though; Darius Vassell broke the offside trap to race through to score the City fourth and, though James made a great save after a long run and cross from Thomas, Cole wrapped up the scoring five minutes from time, after Chris Perry had messed up a back header, by practically walking the ball into the net. The boos rang out at the end; you wonder what it would sound like if many more of the crowd stayed to the end of the match these days - I reckon only about eight - ten thousand remained at the final whistle. Another embarrassing home defeat - Fulham and Wigan must be kicking themselves as the only clubs not to win at The Valley this season! The blokes behind me were in heaven, criticizing all and sundry, wondering why El Karkouri wasn't playing, why Hermann was, who that Dane who used to take our free kicks was, and why we haven't had anyone since who could take one well - wonderful stuff. Not! Unsurprisingly, they missed the fifth City goal, having left well before to catch the early train back to Tottenham-land. The best comment though came from in front of me, and advised David Sommeil (left) that he should have gone to Specsavers! Crouch beats Jeffers, or does he? Did you see it? Peter Crouch picks the ball up on the half way line, chests the ball down, and turns toward goal. He makes his way forward, nobody tries to tackle him. The Wigan defence backs off to the penalty area edge. Crouch draws back the right peg and shoots! The ball immediately cannons off the defender and loops into the air, still heading toward goal. The goalkeeper, Mike Pollitt, backpedals furiously as the ball is arcing over his head. He leaps into the air and, trying to push it over the bar, but succeeds only in palming the ball into the back of the net. Goal! But who's? Crouch wheels away and takes the acclaim. Was this his first goal in over twenty four hours of playing time? His first for Liverpool? Or was it an own goal, either from the defender who deflected it upwards or by Pollitt, who had the last, crucial, touch? Dubious goals committee - please give us a huge belly laugh and give the goal to Pollitt. This season needs bringing to life, and keeping the Crouch versus Jeffers goal race alive would do that! STOP PRESS! As I type, Crouch has scored a real goal! No doubt about this one! Franny, you are beaten! The Crouch-ing Tiger wins over the Hidden Dragon! Has anyone else seen these pics of Cristiano Ronaldo appearing on a Portuguese drag queen TV show from a few months back? Very revealing! I'm sure as soon as the person here touched him (who is apparently one of the few women on the show) he threw himself to the ground and writhed around in agony, claiming a free kick...that's what he usually does isn't it? Things have come back down to earth somewhat, after the horrible defeat to Blackburn in midweek, and Curbs is putting a positive spin on Sundays game against Manchester City. What is intriguing me at present, is that there is definite talk from our manager about changing the formation. He not talking about going back to 4-4-2 though, but to 4-5-1! Now I thought that that was the system we were playing, though when Thomas and Rommedahl are the wide boys the team has a more 4-3-3 feel to it. All this has been brought forward by the five consecutive losses, and the suspension to Radistan Kishishev (left - the man causing all the trouble!) this Sunday, meaning that a change is being forced to the midfield. So who should, and could, replace Kish in the team? Anyone is the call from certain sections of supporters who only see wrong in our Bulgarian. Seriously though, if we want to go like-for-like, the closest we have to a replacement is Barry Fuller, who has regularly played the similar holding midfield role in the reserves for the last 18 months or so. Fuller has only made the first team pitch on a couple of occasions as sub though, so it will be a big jump should Curbs decide on this option. The other obvious possibilities are for either Matt Holland or Bryan Hughes to be drafted in. Holland will run all day, but lacks the tackling skills or inclination of Kishishev, while Hughes offers more attcking threat but is of a less defensive nature. Other less likely options are Talal El Karkouri being moved forward from defence to midfield, or Darren Ambrose being played centrally. My guess though, from the formation change comments, is that Kishishev's replacement could be a forward (we'll come on to who later), with just Smertin and Murphy playing in central midfield, with the two wide men playing a little deeper than they have been, thereby making it a true 4-4-2 formation. If this happens, Smertin will play the holding role (and will have to check his desire to get forward and run with the ball...) with Murphy playing deeper and with more defensive responsibility than he has been. If a forward comes in, who will it be? JJ played alongside Darren Bent for some of the game in midweek, but didn't add much threat; Jay Bothroyd is the sort of tall front man that some are calling for to be played up front with Dazza, though Shaun Bartlett (left) is back near fitness again after an ankle injury. It's too soon to consider Jason Euell, and in my opinion too late to consider Kevin Lisbie, though he may get a place on the bench sadly. None of these options are going to scare the pants off the City manager Stuart Pearce; mind you, if we signed and played Ronaldo then Psycho wouldn't be scared! Andersen, Young, Perry, El Karkouri, Hreidersson, Smertin, Murphy, Ambrose, Thomas, Bartlett, Bent. Subs: Myrhe, Spector, Hughes, Holland, Bothroyd. If we get hammered again, then those who say Kish shouldn't be in the team will be shut up. If we win, Uncle Bulgaria will have to fight for a place back in the side. 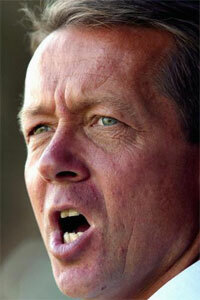 My one to watch tomorrow is the manager - Alan Curbishley. He's under pressure, he's on TV, he must make the calls and take the laurels and sticks when thrown. His correct team selection is vital to our whole season; it may be right, it may be wrong - the fans will let him know for sure by about 4.30, as the first half hour will be crucial to the outcome. Pedro45 will now make his score prediction - a very un-pretty 1-1 draw, with not a lot to shout about unfortunately, and no questions fully answered! Hopefully, the lads will come up trumps. We are great at snatching defeats from the jaws of great victories, and sometimes bounce back when people least expect it. Hopefully, tomorrow will be one of the good days. Come on you reds! Not too much to say about the forthcoming game, except that the crowd will turn quite quickly if the players don't get their act together and perform for a whole 90 minutes. Andersen, Young, Perry, El Karkouri, Hreidersson, Smertin, Kishishev, Murphy, Ambrose, Rommedahl, and Bent; but this is not the team that will play against Manchester City at The Valley in front of the Sky cameras on Sunday. Actually, any of the three senior keepers could play - Deano was at fault for the second goal last night (see pic - nice dive but who presented it to Thommo initially? ); Andersen has been blamed for a few recently too, so don't be surprised to see Myrhe given a chance! Perry must return; the defence is not at all solid without him. Powell is too old sadly; if he could maintain his performance over the whole match I'd be backing him, but he can't. Hermann must play at left back and that means the Elk will get one more chance to regain last seasons form. Kish is suspended, so that means a place for (probably) Matt Holland, or maybe Bryan Hughes (or even Fuller if Young plays). Rommedahl should come back into the team on the right. JJ can join Ipswich (please). All of a sudden, our strongest squad ever is looking stretched - no experience at right back; three goalies and unsure about who's best; dodgy central defence; and left back fitness issues. I hope the team can win back the crowd, because at the moment they are lost, and that will not go down very well in the boardroom. Heads will roll if we fail much more. In all my years of supporting Charlton, and I still cannot get used to it! I really cannot comment on how many times I've seen Charlton throw away leads - OK, it wasn't the worst; 4-0 up at Burnley and we just about held on for a draw took some beating! But for some reason, maybe because it was the second time at home this season so far, this match left everyone numb. It's like a death in the family, the stages of grief - Denial, Anger, Bargaining, Depression, Acceptance - all Charlton fans (plus the players and management) are having to go through them at the moment following this defeat! Could you believe it? No, nor could I! Were you happy? No, I was absolutely fuming sat in Floyds afterwards! Did you appreciate that Rovers played very well, especially in the last 15 minutes? Most blogs are saying that, and trying to come to terms with what a great goal the second (Thompson) goal was. Did it make you depressed and sad? Of course, we all feel very bad about it and wish that, for once, we could get to (or near) a cup final. So what went wrong? Why did we throw the two goal lead away? How can we prevent it happening again? Basic troubleshooting stuff Curbs, I hope you are reading this! You, and the team need to learn from this result and get better. It's what everyone strives to do in life and just because some of the team get paid £30 grand a week doesn't mean that they are absolved from this. Was it Mark Hughes good substitutions that turned the game, or Curbs bad ones? It seems that Luke Young was injured to some extent, so that change was forced on the team. It also happened at a time when Chris Powell was struggling with cramp (or a knock of some sort); Powell struggled on but was poor for the last fifteen minutes. At that stage, Bryan Hughes for Powell would have be more sound in my judgement, with Kish at right back and Spector moving over to the left. If JJ was knackered, Thomas could have come on for him and done as good a job (maybe better, he might have held the ball for a few minutes...). For Rovers, two subs scored, so that looks like brilliant management doesn't it. But all three goals conceded were results of poor defending (everyone knows who the culprits were...) and could and should have been prevented (Blackburn will argue the same about Charlton's goals by the way). On a positive note, because that's what we need to get from the catastrophe, we played pretty well over the first hour, but once again the possible lack of fitness (Chrissy really is a passenger for most of the last 25 minutes these days, and Smertin goes off the boil too!) took a terrible toll. We really are a 45 mnute team in most matches - check the stats; we either have a good first half or second half, but never both...even when we used to win games. Bent ran tirelessly; Ambrose scored again and, contradicting other views, I thought JJ played reasonably well, staying wide in a defensive mode when Rovers had the ball, but getting in close to Dazza when the goalie kicks were being sent out. Smerts looked back near his best, getting fully involved, Murphy too (great goal - see pic - by the way! ), and Kish was the star of the first half. In defence, El Karkouri and Hreidersson started to gel and, apart from the odd moment, handled Bellamy pretty well. The full backs both looked good and got forward in support very well. Deano even made a couple of good saves...but all that was before the last fifteen. What to do? Should Curbs be sacked? Of course not. But there is more chance of him resigning after last night. How would you feel if the players couldn't be trusted to stick to basics and play as a team? Can he motivate the players once more and get us back on a winning track? He will consider that question quite hard I reckon with a few potential jobs up for grabs (and I include Rangers in this equation now!). Of course, some fans are calling for heads to roll; either players or coaches, and that may well happen, but not as a knee-jerk reaction I hope, as that never results in anything positive. 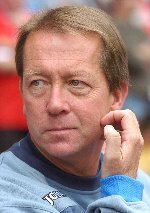 We are very lucky to have had Mr Curbishley as our manager for the last fifteen years, through thick and thin. Last night the meat menu was a beef steak followed by carpaccio. One day Charlton will realise that starters come before the main course in upmarket restaurants!